The weather is very changeable and can contrast from bright sunshine to pouring rain and freezing temperatures at almost any time of the year in Cumbria and the Lake District. Be prepared for being sunburnt and cold and wet on the same day by bringing enough clothing, food and water, especially if walking long distances. Obtain a long range weather forecast before arriving to be better prepared. Check the weather for the Lake District now. View the weather and landscape using one of the Lake District webcams which is in Grasmere. Weather can be localised so that we cannot expect an accurate predication for all parts of the Lake District but at least we can have some indication. 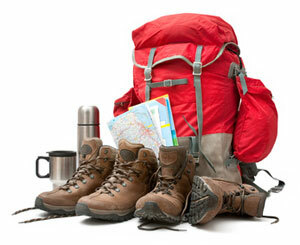 Walkers are generally well informed and prepared for long hours outdoors. They know to take a mobile phone in case of accidents and will have the phone number of the local Search and Rescue centre. Proper footwear is essential when walking the hills in the Lake District. Occasional weekend walkers sometimes decide to spend a few days, for a change, and discover to their annoyance that their footwear is not waterproof. Cold wet feet will spoil your walking and possibly your weekend break. Walkers use wax based dubbing to waterproof shoes and boots. Try to check your footwear for waterproofing before you leave home. You may find that there is a drying room in your accommodation. It is not an uncommon sight to see people drying their wet socks and boots beside a woodburner or open fire. If you have not yet booked accommodation for a holiday in the Lakes, do check our list of self-catering accommodation for walkers in the Lake District.